So I have a confession to make. Most of the time, I try to write posts on Friday night and schedule them for Saturday morning. This week however, it truly is a “Saturday morning over hot chocolate” kind of morning. The house is quiet and began with just me, Pollux (our dog) and a cuppa hot chocolate. Not a bad way to start the day. Social media can be a double edged sword. Despite distance, it can make you feel in–cluded in what’s going on in the lives of others but at other times it accentuates the distance. This week, the regional retreat for Global Missions’ personnel in the Europe/Middle-East region took place in Thessaloniki, Greece. MK Ministries had activities for the kids and there were sessions for the adults with Terry & Melody Shock, not to mention times of sightseeing & fellowship. We couldn’t attend, partially because of the boys’ school but mostly due to finances. Had it not fallen on the same year as July’s NAYC trip, it might’ve been feasible, but even still – flying 5 people to Greece and lodging them for several days represents a larger sum than our current regular funding level allows. It was tough to see others wading in the river where Paul baptized Lydia or walking around Mars Hill. This was one of those times when social media accentuated the distance. Moving right along… you’ll remember that last weekend Liz & I were in Melun for Bible School. Those weekends are always tiring, essentially because they involve 6-hours of driving and teaching, in addition to an already busy enough weekend schedule. There is satisfaction, however, in seeing young people come alive as they study the word of God and principles of leadership in a Christian context. Given that I (Mike) teach ESL in Angers on Mondays (drove by Chateau Montreuil-Bellay on my way home), any thought of “recovery” would have to wait until Tuesday morning, but ohhhh… did Tuesday morning feel good! Dominic was elected class president this week but apparently wasn’t all that phased about it as he “forgot to tell us” initially. We see that as God honoring his desire to take the Lord into his school. Timo has taken up ping-pong and goes out each Thursday night at the same time as Sophie is involved in Archery. He got 11.25/20 on a French dictation test this week: the fruit of a LOT of work. Not bad for only his 2nd year of French – especially given that there were several “zeros” in the class. Again… we give God the praise for that. School break… the boys are both very glad to be on school holidays for the next 2 weeks. The schedule here is: 6 weeks of class, 2 weeks of holidays… 6wks, 2wks… etc. for the whole school year. Our ongoing monthly expenses have increased since arriving in France in 2015. If you’d like to become a monthly partner or make a one-time donation, you can do so using our newly updated Partner in Mission form. If you’re a member of one of our UPCI churches in North America, would you consider submitting our name for consideration by your pastor or you Missions Committee. I’d be happy to get in touch with pastors or churches to answer any questions they may have. Dominic is going to need braces in the next few months. Sophie will graduate from Abeka Academy in Pensacola, Florida in May. These represent significant costs over and above our current monthly budget. Would you or your church consider helping us with these things? To those of you who already support us regularly, thank you SO MUCH… you give us strength and are making a difference in France! God bless each of you this week! 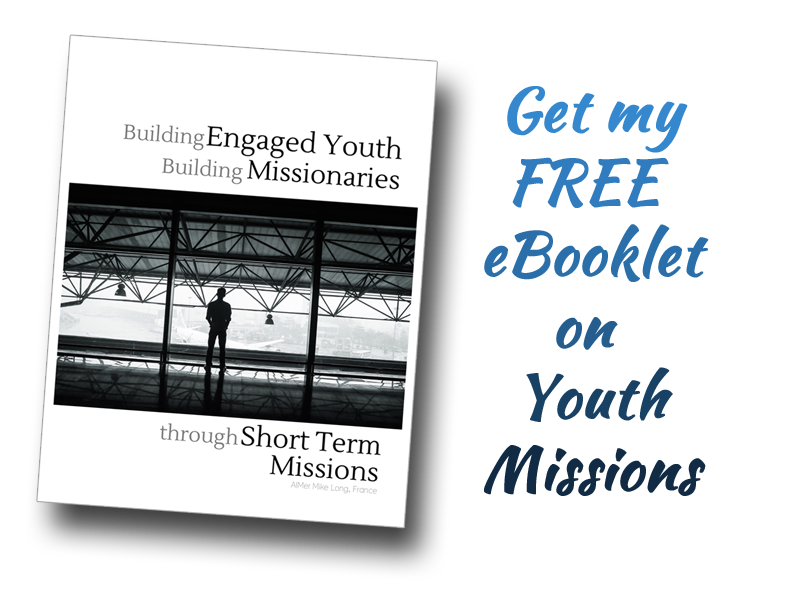 On Monday watch for a new STM Monday post on how to talk to your pastor about getting involved with short-term missions when you feel God’s been dealing with you about it.